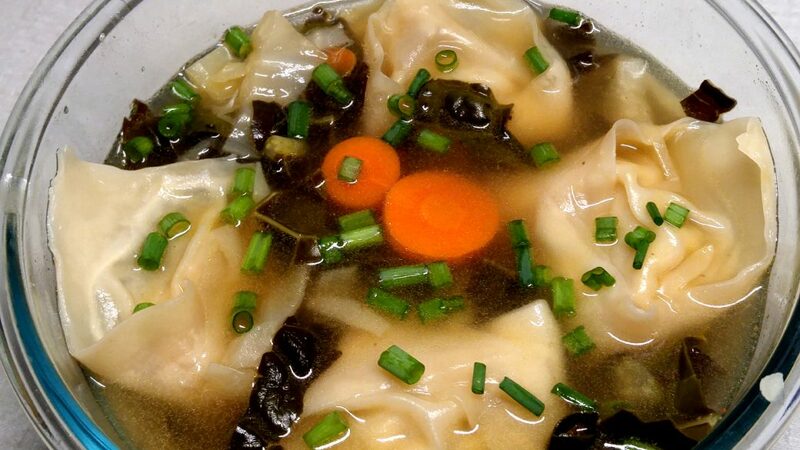 This super healthy, warm, delicious dish is a fusion of European cabbage soup with an Asian wonton soup inspired flair. These wontons are stuffed with steamed acorn squash, chia seeds, and ground almonds. This combination provides both sweet and savory. Topped with scallions. We are going to steam the squash, so before you prep, it, set up your steamer by using 2 cups of water and bring to a boil. Wet a paper towel, squeeze out the extra water and place on your cutting board. This will help the squash from sliding around as you peel it. Cut the top and bottom off the squash and place upright on the towel. Using a peeler or knife remove the skin. Carefully slice the squash in half long ways. Use a metal spoon and scoop out the seeds. Lay the squash cut side down and carefully cut lengthwise into 1” wide slices. Cut the slices into 1” pieces. These smaller pieces will allow the squash to steam quicker and more evenly. Place your bunch of kale whole on top of the squash and steam covered for about 12 minutes. While the squash and kale are steaming let’s prepare the soup. In a medium pot, add all the soup broth ingredients, bring to a boil and simmer covered. After 12 minutes, remove the steamed kale, chop them up and add them to your soup pot along with all the broth. Add your steamed acorn squash to a large bowl and combine the chia seeds, ground fennel seeds, and ½ cup ground almonds. I prefer to steam my wontons separately from the soup. I use about 1 tsp of filling, place a scoop in the middle of the wrapper. Using water, wet all four sides and fold into a triangle. Wet the far corners of the triangles and bring them together and pinch them. There are many ways to fold wontons. Chose the one you prefer. I will be doing a wonton folding series soon. As this recipe will make 50+ wontons they can be frozen before they are steamed. The best way to freeze them is to lay them out on a tray in the freezer and after about 2 hours you can put them in freezer bags. This way they don’t stick together.